This larger Alpine-style room is fitted with parquet floors and light-wood furnishings (the rooms on the second floor also have the typical wooden beams). It offers a flat-screen TV, an equipped en-suite bathroom (with shower, wc, bidet and hairdryer), free Wi-Fi and a private balcony with views of the surrounding mountains (except for the rooms on the ground floor). 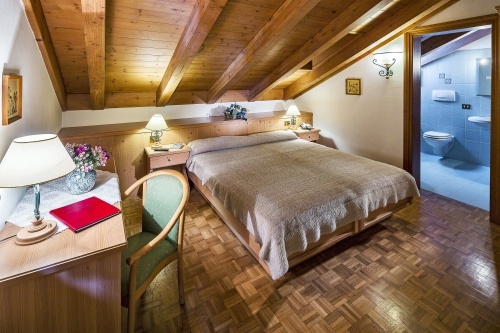 This larger Alpine-style room is fitted with parquet floors and light-wood furnishings and has free Wi-Fi. It offers a flat-screen TV, an equipped en-suite bathroom (with shower, wc, bidet and hairdryer), and a private balcony with views of the surrounding mountains (except for the rooms on the ground floor). 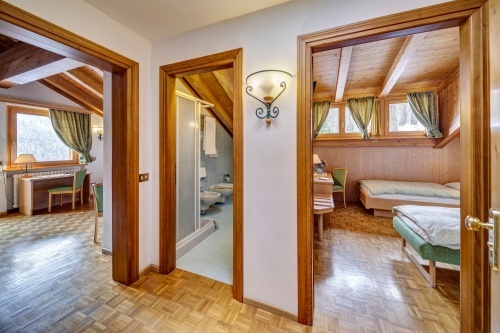 This Alpine-style room is composed of 2 interconnecting rooms and a bathroom (with shower, wc, bidet and hairdryer). It is fitted with parquet floors and light-wood furnishings (the rooms on the seconf floor also have the typical wooden beams). It offers a flat-screen TV, free Wi-Fi and a private balcony with views of the surrounding mountains. It features a double bedroom and a twin-bedded room or a triple bedroom and a single room. 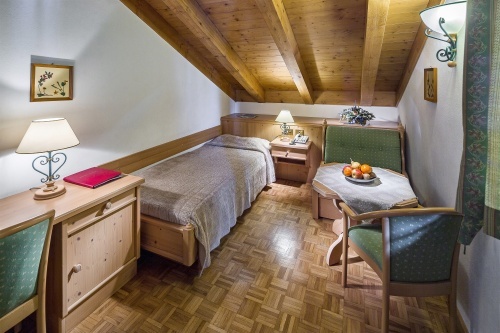 This Alpine-style room is fitted with parquet floors and light-wood furnishings (the rooms on the seconf floor also have the typical wooden beams). It offers a flat-screen TV, an equipped en-suite bathroom (with shower, wc, bidet and hairdryer), free Wi-Fi and a private balcony with views of the surrounding mountains (except for the rooms on the ground floor).